Cobra Sport are raising money this year for the 2017 Mistress Cutlers’ Challenge. Since 2008, Sheffield folk have raised over £1 million for worthy causes through the Cutler’s £50 Challenge. This year the Mistress Cutler is taking charge to raise money for The Children’s Hospital Charity and The Cavendish Centre for Cancer Care. Help us to raise more than ever, to help support children and families through difficult times. 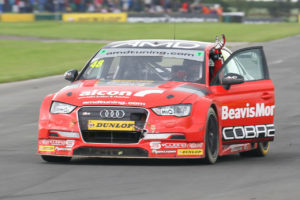 For the latest challenge, Cobra Sport Managing Director Rachel Jarvis will be taken as a passenger around Donington Circuit by professional BTCC racing driver Ollie Jackson in the AmDTuning with Cobra Exhaust Audi S3 2017 British Touring Car at the upcoming VAG Tuner LIVE show. Ollie says he is looking forward to it … Rachel is not! Please support this exceptional cause, all proceeds will be going straight to the Mistress Cutler’s Challenge and video footage of the event will be posted online after the event! We are accepting donations online through the PayPal donations system and in the reception at our HQ in Sheffield. To donate please click below!